MALVERN, Pa.--(BUSINESS WIRE)-- The Micro-Measurements® brand of Vishay Precision Group, Inc. (NYSE: VPG) (www.micro-measurements.com), industry experts in the design, development, and manufacture of resistive-foil sensors for high-precision strain, high-stress and force mechanism measurements, today introduced the Gagekote #1, an expansion of the Gagekote Series, a solvent-thinned (toluene) synthetic resin. The Gagekote #1 is ideal for applications in PCB testing, agriculture, civil engineering, automotive, stress analysis aviation/defense/aerospace, education, medical, Internet of Things (IOT), Robotics, Industry 4.0, consumer, Process monitoring, load cell manufacturer. Transportation, Energy, and smart manufacturing industries. The Gagekote #1, often used as a pre-coat for Gagekote #5 and Epoxylite #813, is resistant to moisture, and offers a wide-operating temperature range that is easily removable after exposure to temperatures as high as 500F. It was designed to provide maximum stability of the strain gage sensor, as moisture is the most common cause of field installation failures. Field installation of strain gages present stress analysts with several unique challenges, particularly when long-term measurements are required, and when massive structures or inclement weather are encountered. For example, strain gage sensor performance is easily degraded by the effects of moisture, chemical attack, or mechanical damage. As a result, strain gage sensors require varying degrees of protection, according to the severity of the environment in which they must operate. 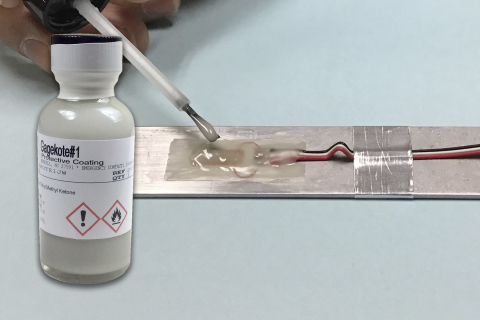 The Gagekote #1 provides maximum stability of the strain gage sensor through its protective coating that is immediately chemically stable and highly resistant to water-vapor transmission. The coating only protects against incidental mechanical damage, like minor objects lightly coming into contact with the installation, or very lightly dragging across it. Further information about Micro-Measurements strain gages and technical support is available at www.micro-measurements.com. Follow Micro-Measurements at www.strainblog.com or on Twitter @strain_gage. Vishay Precision Group, Inc. is an internationally recognized designer, manufacturer and marketer of: components based on its resistive foil technology; sensors; and sensor-based measurement systems specializing in the growing markets of stress, force, weight, pressure, and current measurements. VPG is a market leader of foil technology products, providing ongoing technology innovations in precision foil resistors and foil strain gages, which are the foundation of the company’s force sensors products and its weighing and control systems. The product portfolio consists of a variety of well-established brand names recognized for precision and quality in the marketplace. To learn more, visit VPG at www.vpgsensors.com. Source: Vishay Precision Group, Inc.